Holidays and visiting family in my household mean loads of primally inspired/paleo cooking & baking. It’s bonus time for me with numerous members of the family introducing new and cooking up old favourites. These holidays are no exception. Also with a break from the 9-5 hurly burly, there has been also time to change out my blog masthead image. My Chocolate Fudge Cake with Strawberry Cream has stood the test of time. It was one of the first primally inspired cakes I had made and was at the beginning of my food photography passion – all soft blurs (read, out of focus because I hadn’t worked out the focusing thingi on the camera!). So what better time to create a new image that says what this blog is about – paleo with cream! 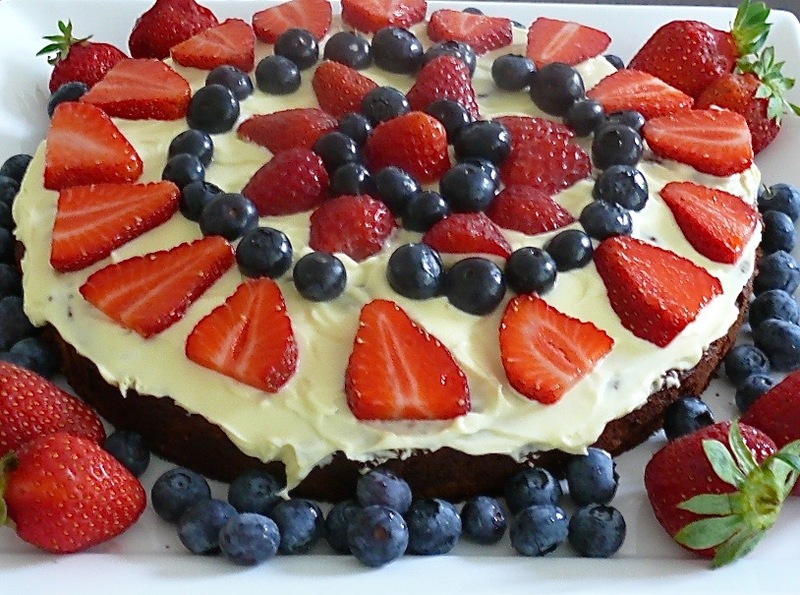 So here we go – Chocolate Orange Cake with Mascarpone Cream & Berries. There are quite a few primal/paleo, gluten-free and grain-free recipes using boiled oranges and I particularly like the recipe from My Petite Kitchen. However these holiday the idea was introduced me to add cocoa and turning it chocolatey. Well, what is the festive season without chocolate! So this is the result. Strawberries and Blueberries to decorate. • Place oranges in a pot of water, bring to the boil then turn down the heat and simmer for 1 hour, remove from water and cool. • Preheat oven to 170C/350F. • Line the bottom of a 23cm/9in springform baking pan (or smaller if you want a thicker cake), and grease the sides with butter. • Cut cooled oranges into quarters and place in food processor add the chopped dates blitz until smooth. • Add eggs and vanilla and process to mix. • Sift the cocoa and mix in the rest of the dry ingredients. • Add this to the orange/eggy mix and process until well combined. • Spoon into baking pan and smooth the top. • Cool the cake in the pan on a wire rack for 10 -15 mins. • Run a knife around the edge of the cake in the pan then undo the clip and carefully lift the cake back onto the wire rack. • When cool cover the cake with the Mascarpone Cheese and decorate with your favorite berries. • Store in an airtight container in the fridge for up to 5 days – if that is possible! *A word on sweeteners. This recipe is refined sugar free and with all my recipes I pump for the lowest quantity of sweetener I can get away with. But this time I did use more dates that usual, even so, I wouldn’t describe this as a very sweet cake. Hi, are the orange peeled? Hi Rene, no the oranges are not peeled. I know it sounds strange but it does work! Yum, it looks great. Can’t wait to try it!